I'll have to take a look and see if those extenders work on the 1080ti card. Now if I can get a third card connected to the motherboard, the only other concern I would have is how to mount it. Is that something I should also look into or can this card be connected and remain 'loose' inside the case? That has me worried. Message 1897872 - Posted: 28 Oct 2017, 15:13:59 UTC - in response to Message 1897865. You are MUCH better off using the available slot on the MB and modify the USB2 cables (if needed) than using a PCIe extender. It will fit as long as the MB cables can do a right angle in about 5/16 inch. Message 1897906 - Posted: 28 Oct 2017, 18:01:10 UTC - in response to Message 1897872. I use one of this pin extenders on the USB 3.0 port in my 4xGPU host to allow to use the last slot for the 4 GPU. Works perfect. So we tried Linux via Ubuntu and all I can says is... I gave up. It took four hours just to get Boinc running on the OS and the darn thing wasn't using any of the GPU cards. So we threw up out hands in defeat and decided to get Windows 10 instead. Once we get everything running, we'll just run Linux over WIndows 10 and figure it out from there. So here's where we're at right now with this newly built computer. So the team's page lists the two Graphics Cards successfully, but I think I've stumbled into a block. 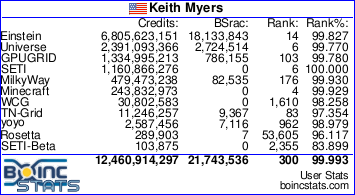 I don't think BOINC is using the graphics cards at all. Here are the details I've gathered from it's progress page. Do these specs looks appropriate for the system we got here? How do we tell if it's using the cards? And the BOINC program also suspends itself when I tell it not to suspend in the options. Message 1898171 - Posted: 30 Oct 2017, 0:07:26 UTC - in response to Message 1898160. Those are simply the CPU benchmarks and upload/download speeds. Nothing to do with the gpus. You need to post the first 30 lines of the Event Log after a fresh start of BOINC to determine whether BOINC is seeing your gpus. Message 1898172 - Posted: 30 Oct 2017, 0:07:56 UTC - in response to Message 1898160. 10/29/2017 4:32:28 PM | SETI@home | Sending scheduler request: To fetch work. Message 1898189 - Posted: 30 Oct 2017, 0:45:43 UTC - in response to Message 1898174. Message 1898193 - Posted: 30 Oct 2017, 0:50:22 UTC - in response to Message 1898160. I take it you tried using the BOINC Install from the Repository? If so, your experience is common. That's why I built the BOINC All In One Package for Ubuntu. All you have to do to get BOINC running is Install the OS & Driver, Download the AIO package and unpack it to your Home folder. Read the ReadMe for the Library Links, place the Libraries in the setiathome.berkeley.edu folder, then Double click on boincmgr. It shouldn't take more than 30 minutes to Install Ubuntu and have BOINC running the Special CUDA App. The biggest point is you need to start with a Clean install, Old Configuration files from the Repository BOINC may cause trouble, so, best to Erase the Old System. The CUDA Special App is around Twice as fast as what you can run in Windows. I looked at the dual 1080 computer and it shows this. so yes it is using the GPUs. Message 1898261 - Posted: 30 Oct 2017, 13:42:01 UTC - in response to Message 1898189. First, thank you TBar for that recommendation. When we try Linux again, I will do just that. View... The 'View' pulldown window is how you access those commands. Not in settings, but view. That is the worst design ever. I showed my Dad those very steps and he didn't even know they existed! We're honestly disappointed by this revelation because we never would have figured out that we needed to go through 'view' to find these options. Thank you Zalster for telling us this. First, a thank you to everyone tho contributed to this thread. Everyone here helped us out immensely! I hope posting in this thread after seeing it 3 pages back doesn't constitute as resurrecting a thread, but I figured I'd post an update regarding the machines. Here are the two machines we've made so far. All of these systems are running Windows 10 64bit. Problem? We don't think the GPUs are pulling their weight. For example, I had the 16 core thread ripper running and one task said it was going to take 11 hours to complete. 11 HOURS. Something about that didn't seem right. So I go to check the task manager to see what Boinc was running at, and the GPU usage was almost always in the single digits. Only once out of several readings did it ever to above 50%, but it would fall right back into 5% or 7% and stay there. I've followed the steps in ensuring the software always uses the GPU no matter what, but I'm at a loss as to how to get Boinc to run off the GPUs. Suggestions? Message 1906804 - Posted: 13 Dec 2017, 18:43:07 UTC - in response to Message 1906795. It looks like the GPUs are working. Only 1 task had validated, it take IIRC 11 tasks to validate before the est run times better reflect reality. Message 1906807 - Posted: 13 Dec 2017, 18:47:56 UTC - in response to Message 1906795.
can you link your father's computers, I only see your computer under your profile. Message 1906808 - Posted: 13 Dec 2017, 18:51:19 UTC - in response to Message 1906795. What kind of 1080Tis did you get. Depending on what kind they are will determine how many work units you can run on each. Air flow is a major concern. Message 1906830 - Posted: 13 Dec 2017, 20:09:54 UTC - in response to Message 1906795. So I go to check the task manager to see what Boinc was running at, and the GPU usage was almost always in the single digits. Only once out of several readings did it ever to above 50%, but it would fall right back into 5% or 7% and stay there. You'll want to check GPUGRID thread Windows 10 GPU meter can't see GPUGrid because it actually can show computing but not with the default settings. Message 1906836 - Posted: 13 Dec 2017, 20:41:04 UTC - in response to Message 1906830. I would make the recommendation not to use task manager at all. If you really want to see what your system is doing, I'd recommend the 2 following programs. This will allow you to see how much of each CPU is being used and how much of each GPU is being utilized. Message 1906840 - Posted: 13 Dec 2017, 20:59:15 UTC - in response to Message 1906836. Whoa. So many software recommendations. Checking it out now. In the meantime, my Dad discovered the 'Properties of task' option on the Boinc Application and it has some interesting details to it. I'll post what I found in there while I look up these apps and get them running.